© 2013. 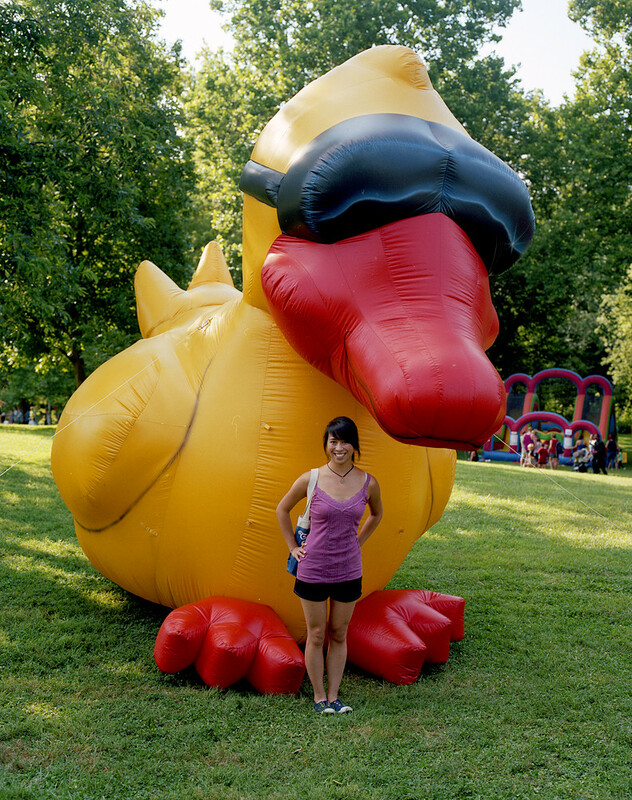 At the 25th annual Rubber Duckie Race in Lancaster County Central Park in July 2013. Kodak Portra 400, Pentax 6×7. © 2013. 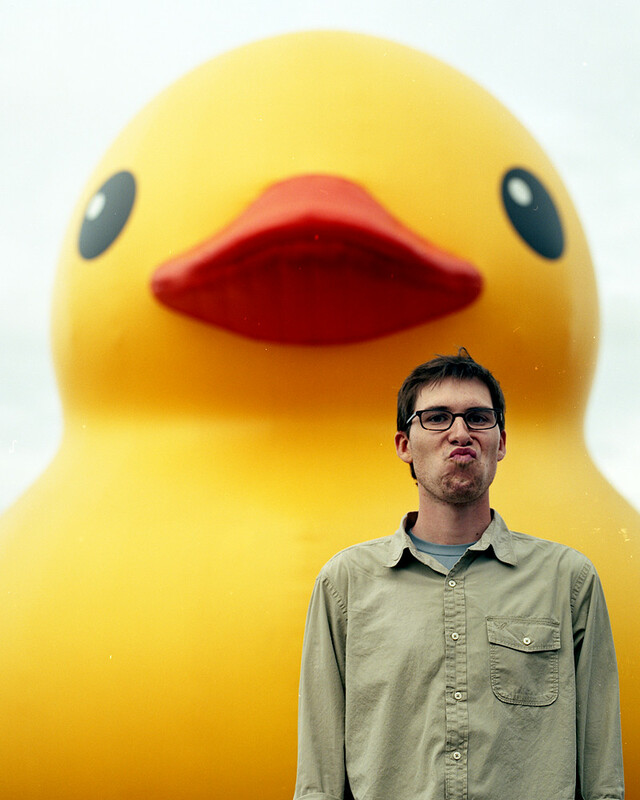 My best attempt at “duck lips.” Rubber Duck art installation in Pittsburgh’s Point State Park. Sunday, Oct. 13, 2013. Portra 400, Pentax 6×7. © 2013. 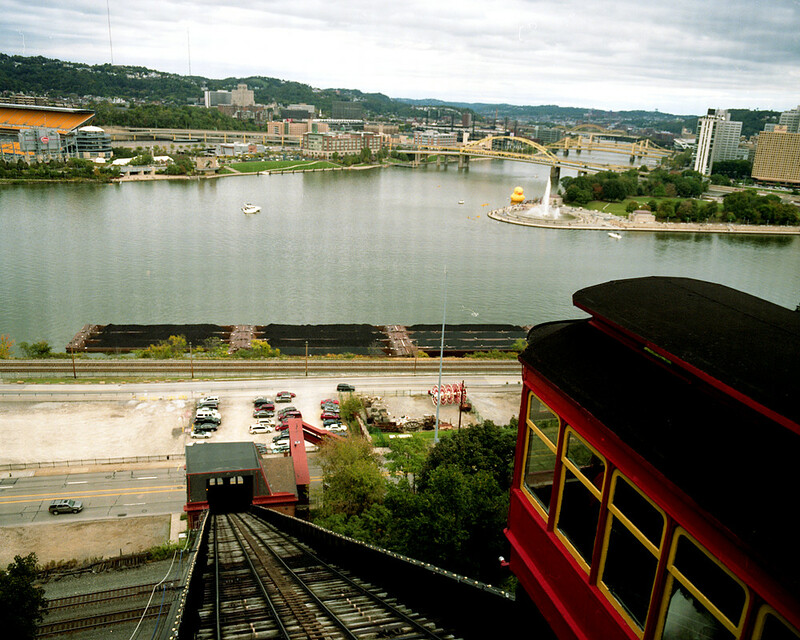 View of Rubber Duck art installation in Pittsburgh’s Point State Park from the Duquesne Incline. Sunday, Oct. 13, 2013. Portra 400, Pentax 6×7. 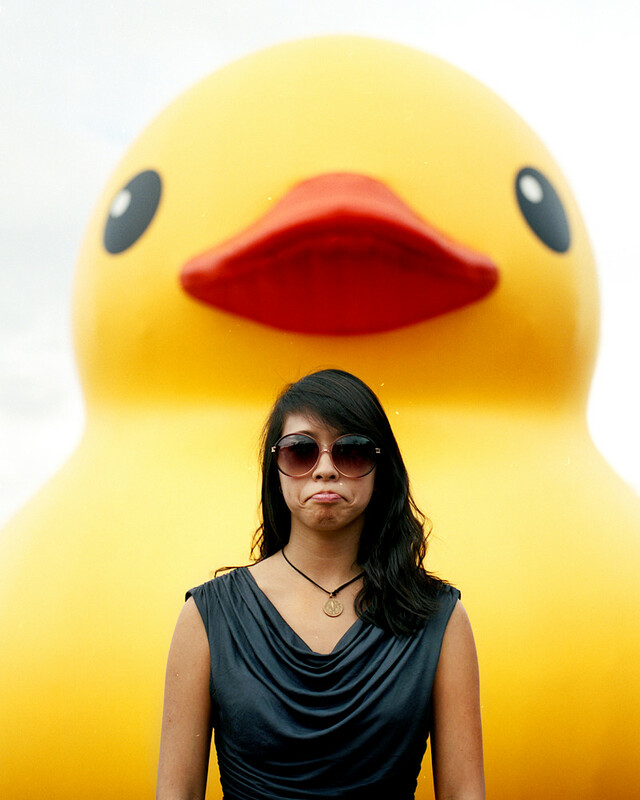 But let’s be real: It was mostly about the duck. Today, I carved my first-ever pumpkin. Granted, my parents bought us pumpkins when I was probably six or seven, and I remember we scooped out pumpkin guts in our patio, but I’m pretty sure my mom handled the knife work. 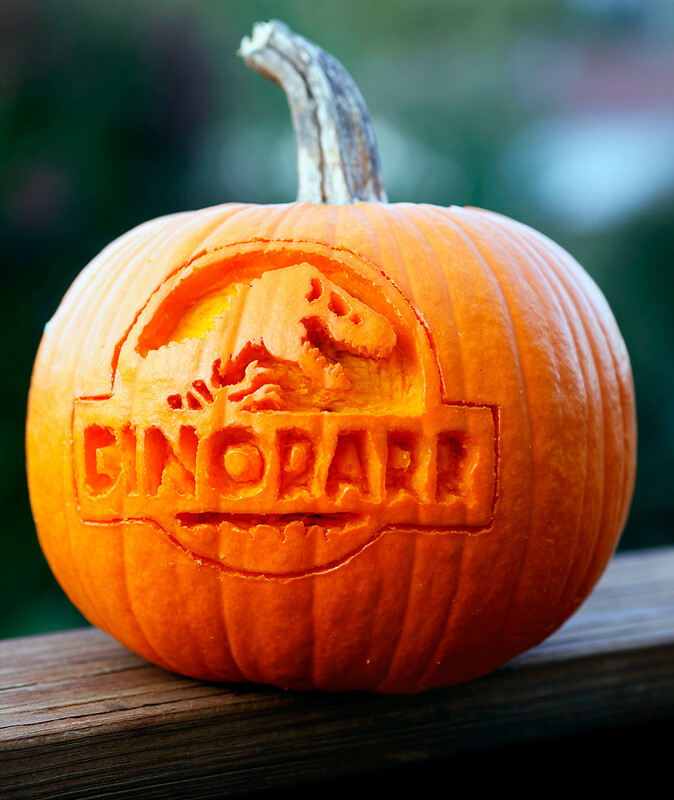 Which means, I’ve never carved a pumpkin. Until today. Jeff and I went to some ridiculous measures to light up my pumpkin for the final shot. Taken with my 28/2.8. 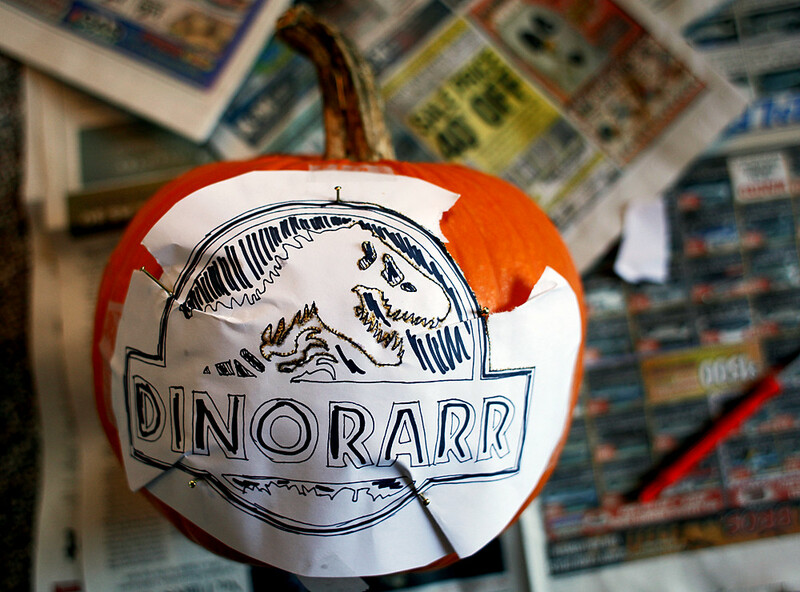 First, I had Jeff print out the “Jurassic Park” logo. Then, using my light table and a Sharpie, I traced it onto another sheet of paper and simplified some of the details, like the teeth. Jeff helped me tape and tack the pattern onto my beautiful pumpkin, which we picked at Barefoot Farm in Dover. Using a weird pick tool (not sure why we have it), I punched small holes along the outlines. Then, once I removed the pattern, I used the same pick to create the lines via the holes. The hardest part was not the teeth, but actually the letters. Taken with my 100/2 lens on our deck. Because the pattern is so intricate, I figured it’d be easier to do a relief carving, rather than actually carving through the flesh and meat. 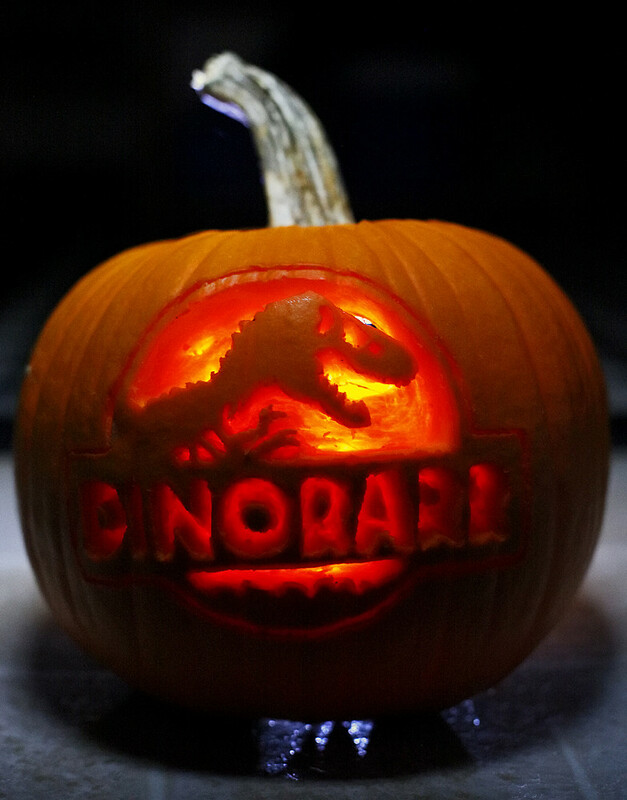 But as we all know, the only thing that matters is how good your pumpkin looks when it’s lit up. So… voila! Taken with my 50/1.4. This is on our kitchen floor. A couple of tea lights are inside the pumpkin. My Boy Scout headlamp is on the floor behind the pumpkin, and Jeff held up his iPad (on a lower brightness setting) and used the iPad fold-over case as a gobo. Yeah. That happened. I promise I’ll have some more, uh, professional photos up soon. And some film, once I pick it up tomorrow and get it scanned over the next few days. Five years ago, Bill Eppridge visited my university. He and his wife Adrienne had some time to visit with students, so I hastily threw together a portfolio for them to review. I was terrified and convinced that they’d tear it apart — Bill being a venerable visual journalist and Adrienne being a venerable visual editor — but they were completely kind and supportive in their criticism and suggestions. Looking back now, I’m guessing they recognized that I didn’t really know what I was doing, and that prodding me along would be more productive than tearing me apart. (Related: I’ll never forget the only written comment that former Columbia Daily Tribune photo editor Gerik provided after reviewing my exit portfolio in May 2010: “Could be a newspaper photographer someday.”) I’ve since made conscious efforts, every time I’m in a position to encourage or review work with a younger photographer, to be just as considerate and supportive as Bill and Adrienne were to me. I’ve just learned that Bill has died. His legacy includes a number of iconic images made in times of peace and war, and I’m certain he inspired and helped young photojournalists who are far more successful than I. But for my part, I’ll never forget the gentle, compassionate critique he and his wife gave me five years ago in the Missouri photo lab. My next portfolio iteration was much more restrained and well-edited enough to land me an internship at The Atlanta Journal-Constitution the following summer, and I’m convinced that Bill and Adrienne gave me just the right push to get my internship applications rolling. Sgt. Curtis Webb moves forward to reinforce the line formation during the 1140th Military Police Company’s riot control training on April 15, 2007. The company, which is a local division of the Missour National Guard, practiced blocks and movement patterns using wooden bats. Columbia City Clerk Sheela Amin swears re-elected mayor Darwin Hindman into office on April 9, 2007. Winning more than 70 percent of the vote, Hindman won a record fifth term. Oklahoma State junior shortstop Jordy Mercer slides home during the series finale against the Tigers on April 6, 2007, in Taylor Stadium. Mercer scored three runs in the game, which the Sooners won 8-6. Andrea Molina and Maria delCarmen Reguera dance the flamenco during the Multicultural Dance Expo’s opening act on March 19, 2007, at Memorial Union. Other dances featured at the expo highlighted Mexican, Indian and Southeast Asian cultures. Robert Ray places a rattlesnake’s still-beating heart on his hand after skinning the snake in front of a small audience on April April 26, 2008, in Mangum, Okla., during the 43rd Annual Mangum Rattlesnake Derby. Ray, a Mangum native who now resides in Oklahoma City, has been butchering rattlesnakes at the derby for 32 years. Sen. Hillary Clinton, D-N.Y., concludes her speech to more than 5,000 supporters on Jan. 19, 2008, in the McCluer North High School gym in Florissant, Mo. Clinton had just won the Nevada primary and was beginning her campaign in Missouri and the other Super Tuesday states. Elton John acknowledges the audience’s screams and applause after making his entrance on Oct. 5, 2007, in Mizzou Arena. During an encore, John wore a headband with tiger ears, which a Missouri fan gave him in anticipation of the Tigers’ football game against Nebraska on Oct. 6. Missouri guard Kassie Drew scans the court to pass the ball away from Nebraska guard Ashly Ford’s block during the game’s second half on Jan. 20, 2007, at Mizzou Arena. The loss was the Tigers’ fifth in conference play. A man holds up a sign to cheer on participants in the Disney World Marathon near Mile 2 on Jan. 13, 2008. The marathon course began and ended in Epcot, and went through each of the theme parks in the Disney World complex. Then-Missouri House of Representatives Minority Floor Leader Jeff Harris, D-Columbia, waits to be recognized by House Speaker Rod Jetton during the House’s morning session on April 17, 2007, in Jefferson City. Harris has since resigned from his position as Minority Floor Leader to concentrate on his campaign for Attorney General. IndyGround LLC hip-hop artist Bustrip freestyles a song and a beat on March 5, 2007, at the Sapphire Lounge. Hailing from Tulsa, Okla., Bustrip has joined forces with seven other rappers to form a new record label in Columbia. Byron Carlisle awaits instruction during swim practice in the Student Recreation Complex on Nov. 9, 2006. Carlisle, who is a competitive swimmer on the University of Missouri swim team, was diagnosed with ADD and dyslexia in the fourth grade. Missouri forward Leo Lyons tries to hold onto the ball as Kansas guards Sherron Collins and Brandon Rush grab at Lyons’ forearm during the game’s second half on Jan. 15, 2007, at Allen Fieldhouse. The Tigers attempted a failed three-point play in the game’s final 11 seconds and lost 80-77 to the Jayhawks. Rest in peace, Bill, and thank you again.